Students and faculty from Emory and other schools are working to expand Wikipedia entries for underrepresented people and topics. Wikipedia, the mammoth online encyclopedia, is a global font of information but its millions of articles frequently lack content and guidance from some key sources – women and underrepresented populations. The Global Women Wikipedia Write-In (GWWI) will be held at Emory on March 18 to try and put a dent in the many needed Wikipedia entries about everything from women leaders, artists and historical figures to topics such as Latin-American folklore and international historical events relating to women’s rights. Emory students and faculty will gather on the first floor of the Woodruff Library at 10 a.m. to contribute articles and entries they’ve researched and written. The event is co-sponsored by Emory’s Center for Faculty Development and Excellence, Center for Women and Center for Digital Scholarship. Wikipedia’s Editors Survey from 2011 found that the average Wikipedia contributor was a white, tech-savvy 30-year-old male. Only 8.5 percent of Wikipedia’s editors were women in 2011 (though Wikipedia now has a goal of 25 percent women editors by 2015), and the vast majority of editors hailed from developed, Western countries such as the United States, Italy, France, Germany and the U.K. The backgrounds of editors, combined with Wikipedia’s reliance on secondary sources such as media coverage to verify articles, result in far fewer entries about topics, individuals and cultures not already recognized by the Western mainstream. "The principal of Wikipedia ballyhoos verifiability over truth. That creates problems for underrepresented peoples of the world," says Allison Adams, associate director of the Center for Faculty Development and Excellence. Recent Emory alumna Roopika Risam, Ph.D. '13, assistant professor of English at Salem State University, and Adeline Koh, assistant professor of literature at Richard Stockton College, created the Global Women Wikipedia Write-In last year as part of their Rewriting Wikipedia Project. "The event is an outgrowth of my research in the postcolonial digital humanities, which explores global issues of race, class, gender, sexuality and disability within cultures of technology," says Risam. "Although digital spaces are often perceived as a democratic and neutral, existing outside of dynamics of power, this is far from the truth. The GWWI raises awareness and helps train new editors to rewrite Wikipedia." Columbia University and Texas State University also will participate in the GWWI on March 18, says Risam. (Join this effort and become a contributor to Wikipedia.). Yanna Yannakakis, associate professor of history at Emory, says students from her course on gender and sexuality in Latin America researched topics and possible entries in teams and then prepared their submissions for the GWWI. 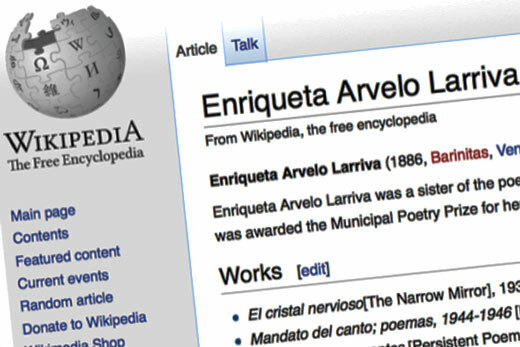 Students are ready to upload articles about La Patasola, a female jungle monster from South American folklore; Enriqueta Arvelo Larriva, a Venezuelan poet; and several other Latin American and Carribean-related people and topics. In order to participate in the event, students must become registered Wikipedia contributors, a process that makes it possible for students to continue to build on the project after the event. The students were creative and resourceful in identifying entries," says Yannakakis. "I’m interested in the contemporary applications of historical knowledge, and online publishing and digital humanities are important new directions. If Wikipedia is lop-sided, I think it’s important to round that out."